*The amount of each ingredient depends on the size and how many pizzas you’re making. Preheat oven to 400 degrees F. Lightly spray with non-stick cooking spray if not using non-stick cookie sheet. Place bread on cookie sheet. Spread pesto on bread – I use the same amount of pesto as if I were buttering a slice of bread – you can use as much or little as you like. 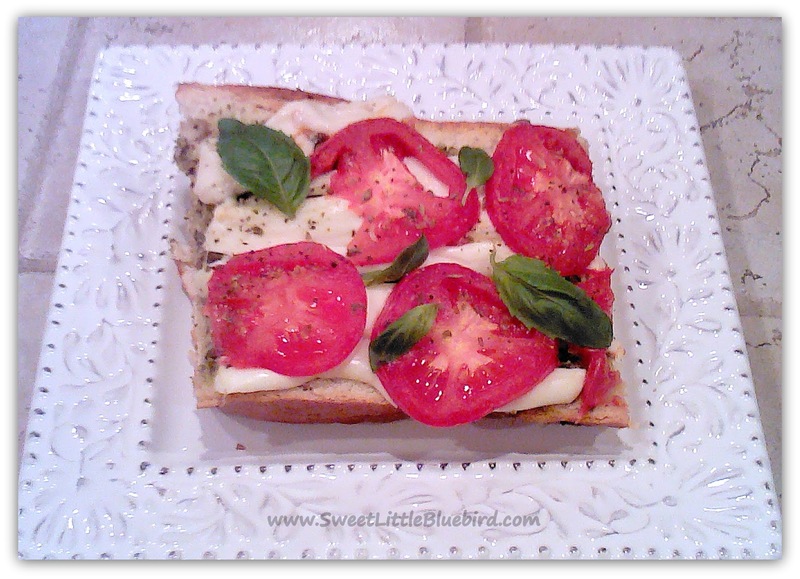 Place slices of mozzarella on top or sprinkle with shredded mozz, enough to cover bread. Top with asparagus, tomatoes and mushrooms. Lightly sprinkle with Pizza seasoning. Bake for 15 mins. Enjoy! Preheat oven to 400 degrees F. Lightly spray with non-stick cooking spray if not using non-stick cookie sheet. Place bread on cookie sheet. 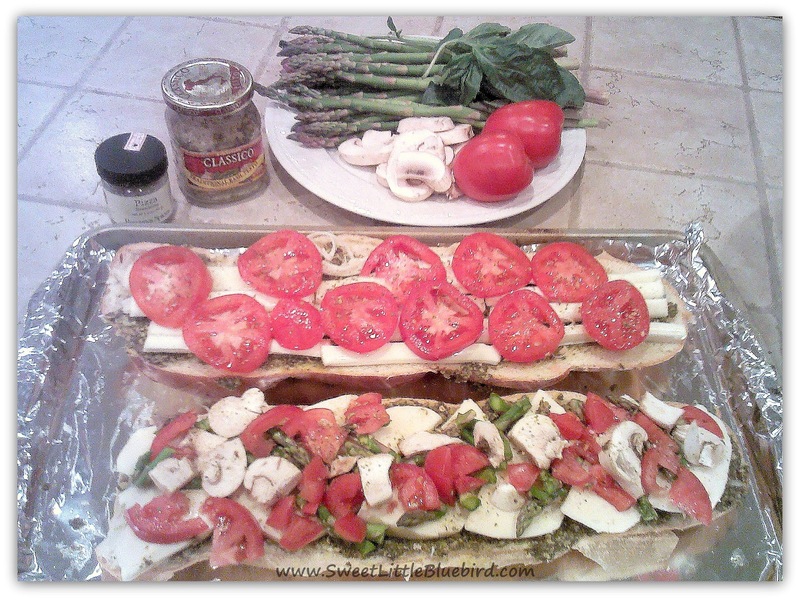 Spread Pesto on top of bread – I use same amount as if I were spreading butter on bread – use as much as you like. Cover with mozzarella. 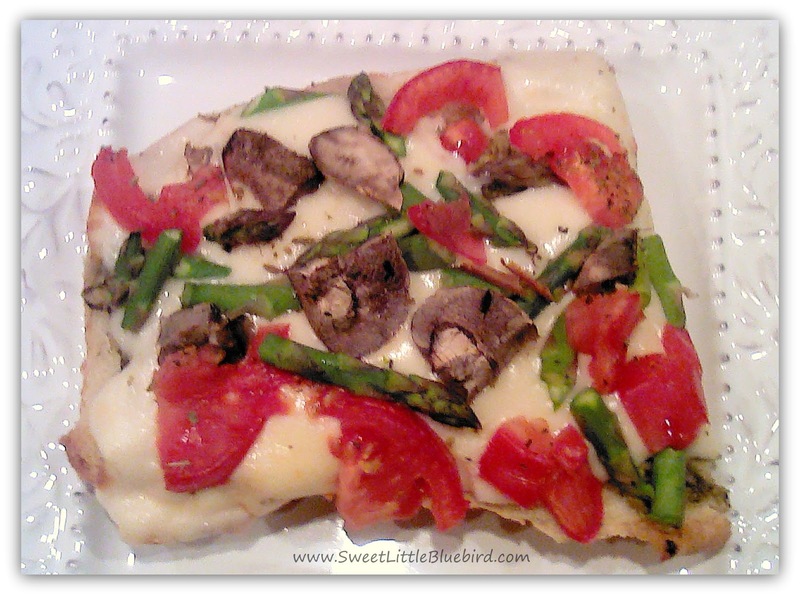 *I ran out of mozzarella and had to use string cheese ;o). Top with tomatoes and sprinkle with pizza seasoning. Bake for 15 mins. Remove and top with fresh basil. Enjoy! « What a difference a few hours can make! Yum!! I need to broaden my culinary horizons. These look amazing!! Yes please! Wow, these both sound awesome! My husband is Italian, so we eat a lot of homemade pizza, can't wait to make this for him! Thanks Mary!